Canning Vale rail: Believe Labor? Or the Barnett Govt, for that matter? The Premier clearly stated in July 2015 that connecting the Armadale and Mandurah rail lines, through Canning Vale, is the no. 1 short-term rail priority for his govt. Budget’s coming – where’s the commitment? Then along came WA Labor, with a rejigged METRONET that’s a plan, but has no prioritisation on which rail will occur when. Today, although Opposition Leader Mark McGowan stated that a rail line connecting those of Armadale and Mandurah has to happen because the areas of Canning Vale, Huntingdale and Forrest Lakes were “absolutely desperate in need of decent public transport”, are we any closer to getting the rail line both parties agree we should have? The Cities of Canning, Gosnells and Cockburn aren’t necessarily going to be linked up any time soon, should Labor take office – below is the reason why. I asked Mr McGowan to detail the prioritisation on rail lines to be built under METRONET – because METRONET is about new rail, extending existing rail, and connecting everything up through circle rail. But as you can see below, WA Labor is yet to determine which type of rail is to come first. Then there is the cost: WA Labor believes it will take $350 to $500m to build this first section of a circle route, complete with up to three stations. Small extension (5kms), big price. Not a lot left over for other rail projects….internal bun fight coming? Mr McGowan has a lot riding on the perception that the southern areas of Perth will get new rail, and soon – Labor’s Matt Keogh is running for the newly created federal seat of Burt, and the man who stood aside for him to do so, Pierre Yang, a City of Gosnells’ Councillor and union favourite, will run for an upper house spot in the area. The City of Canning, which has branded itself The New Energy of the South East, needs to lobby for this circle rail to happen – but its a little weak in the Councillor department when it comes to what it would take. Stay tuned for more news on this, because it has the ability to undermine the new public transport the New Energy will need! To their credit, WA Labor has pledged to legislate METRONET in to law so that it must be built, but which areas first and when – that we need to know before we vote. Our thanks to Channel 7 for its excellent coverage of this issue – however the report states the new line would run from Kenwick. Labor’s plan is to extend the Thornlie Spur Line to connect up to the Mandurah Line. 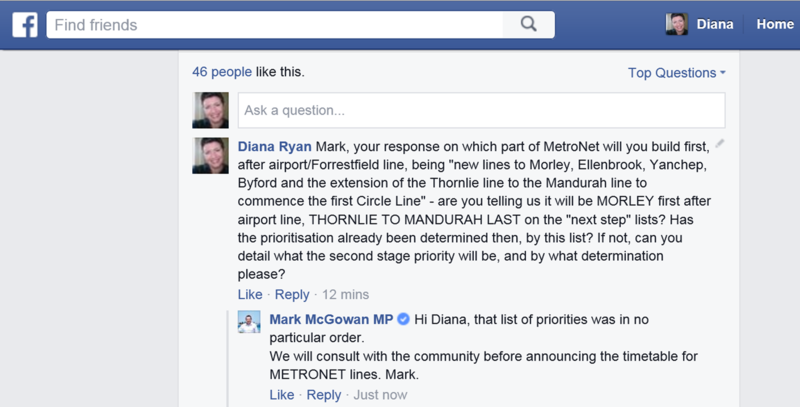 WA Labor FaceBook extract dated September 2015 – Q&A session on METRONET with Mark McGowan. Fire CEO, flip execs, slash costs, get real?